COMMENT: Edible fruit - raw or cooked. Size of a russet potato. Of variable quality, some forms (with orange skins) are exquisite with the flavour of banana custard whilst others (with yellow, white or dark brown skins) can be unpleasant. Another report says that the white fruits are mildly flavoured and later ripening than the orange fruits. The fruit can also be used for making preserves, pies, ice cream and other sweet desserts. The fruit falls from the tree in autumn and is then stored until fully ripe. 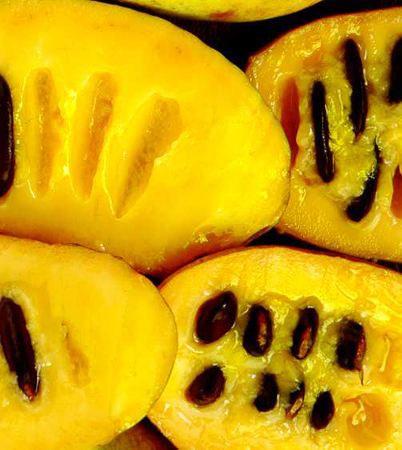 The fruit can cause gastro-intestinal upsets for some people. (1) Generally delicious.